Dagmar Woyde-Koehler is the initiator, curator and director of the MINDKISS Project which she founded after the death of her partner, the Karlsruhe artist OUBEY, in 2004. 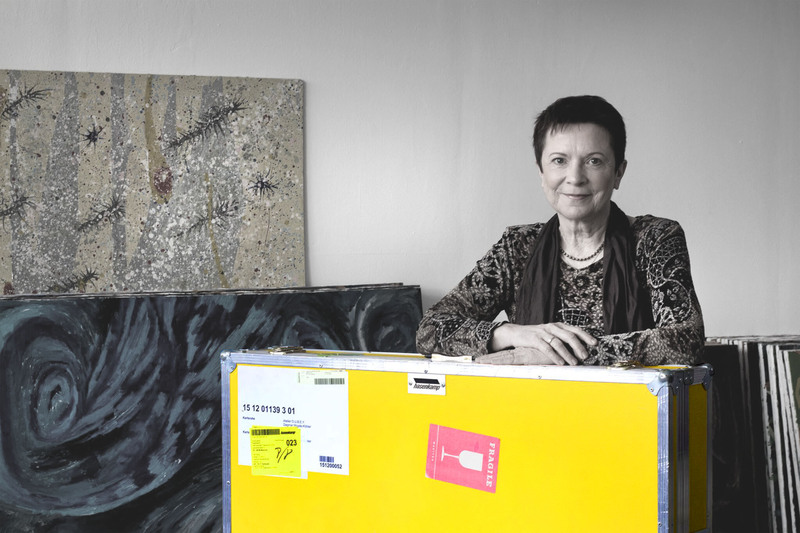 Working independently of the structures of the established art market and in unprecedented ways, ever since then she has brought the artistic legacy of OUBEY to the attention of a global audience. Taking the work of another person, she has created a new work with its own autonomy. Something which has never been seen before. Dagmar Woyde-Koehler has succeeded in launching something astonishing and making the seemingly impossible possible. With her work firmly grounded in life and her thoughts simultaneously always exploring other spheres. She observes life and the world with a highly individual gaze. “The world is full of possibilities. The key to the realization of the seemingly impossible is simply to realize what is possible and do it“. In her thinking and her work she crosses many frontiers which would be prohibitive to others and even does it with apparent ease. “If necessary,” she says “I set my sails against all odds”. Throughout her life Dagmar Woyde-Koehler has always been an inquiring wanderer between worlds. In OUBEY she found a kindred spirit who broadened and extended the universe of her mind with his own. A symbiosis. In her MINDKISS Project she now connects up all things which from her perspective are already indivisibly linked. Science, philosophy and visionary scenarios of the future mix and mingle in her experimental interactive approach. She invites people from a broad range of cultural backgrounds, professions and generations, free of any form of artistic expertise, to explore and find their own way to OUBEYs art in an immediate unfiltered encounter with it. The whole dynamic of the Project is just as explorative as these encounters. “I am a trailblazer. There is no set model for what I do. At least none that I know of. So I think of something in harmony with OUBEY, his art but also myself and in doing so find my own individual ways and concepts. The act of walking creates my way”. “From the very beginning it was clear to me that I would need international resonance. That meant that I would have to board a plane with OUBEYs pictures. So I ignored my fear of flying and flew. And now I can board a plane just like I get into a taxi“. Dagmar Woyde-Koehler has now flown over 350,000 km for the MINDKISS Project, including no less than three trips to the other end of the Earth, to New Zealand where, eager to discover their resonance, she showed OUBEYs pictures to the indigenous Maori people. To protect the pictures during flights, she commissioned a custom-made bright yellow aluminum case both climate-protected and shock-proof. And where ever she appears with this case she excites keen interest. Even in New York City, in downtown Manhattan where she was walking with a picture in the case on her way to an appointment – a moment captured in the first documentary on her project, “The Journey”. "The key to the realization of the seemingly impossible is simply to realize what is possible and do it."